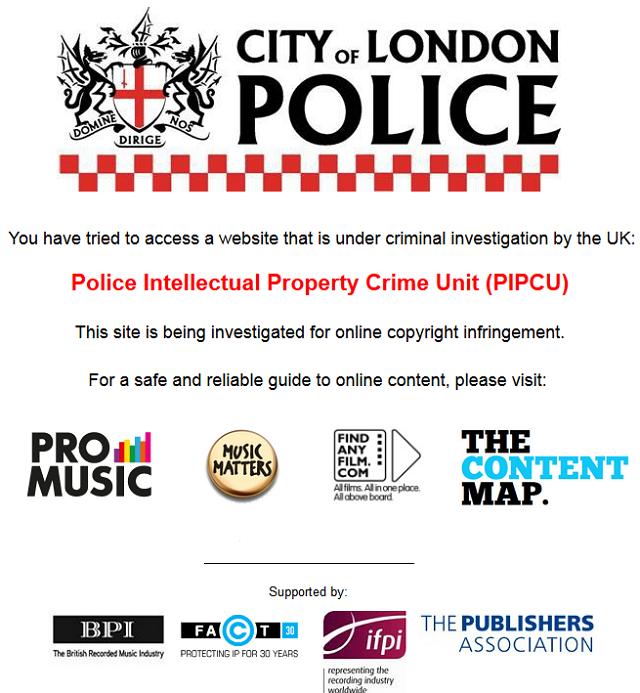 Continuing its attacks on piracy-related domains, the UK Police Intellectual Property Crime Unit has shut down the proxy service Immunicity and several torrent site proxies. The domain names have "seized" by the police and now display a banner warning that the police are investigating the matter. Since last year City of London Police have been working together with copyright holders to topple sites that provide or link to pirated content. The police started by sending warning letters to site owners, asking them to go legit or shut down. Late last year this was followed by a campaign targeted at domain registrars, asking them to suspend the domain names of several “illegal” sites. Yesterday police started out another round of anti-piracy actions targeted at sites that offer access to pirated content. Among the new targets is Immunicity, a general proxy server that was set up as a censorship circumvention tool. The police action against Immunicity is concerning as the service merely allows users to route their traffic through a proxy network, much like other anonimizing services such as TOR and VPNs do. The service itself doesn’t host or link to infringing content. In addition in Immunicity the Pirate Bay proxy Piratereverse.info and KickassTorrents proxies Kickassunblock.info and Katunblock.com were taken down as well. The same happened with movie2kproxy.com, h33tunblock.info and several other sites. The DNS entries of the domains have all been replaced and now point at a PIPCU IP-address which displays a warning banner. PIPCU has not yet confirmed the nature of the takedowns but at the time of writing the most likely explanation is that the U.S. based registrar suspended the sites in question. Based on letters that were sent out to registrars previously, the police accuse proxy services and sites of running a criminal operation. While no court order has been obtained, PIPCU claims to have launched an investigation into the sites and has asked the domain registrar to cooperate. “The owners of the aforementioned domains are suspected to be involved in the criminal distribution of copyrighted material either directly or indirectly and are liable to prosecution under UK law for the following offences: Conspiracy to Defraud, Offences under the Fraud Act 2006, Copyright, Design & Patents Act 1988,” PIPCU states. It’s important to note that with the previous requests the City of London Police did not present a court order or other warrant. However, it turns out that police letterhead is sometimes enough to throw due process concerns overboard. TorrentFreak has asked PIPCU for a comment on the most recent actions, but we have yet to hear back. Update: TorrentFreak has received new information suggesting that PIPCU managed to take control of the domains without the involvement of eNom. We will present more details when we are allowed to share it in public.